The last play of the Black Rep’s 2013-2014 season is also the first play I’ve seen from this well known and much acclaimed St. Louis theatre company. This production of Nobel Prize-winning Nigerian Playwright Wole Soyinka’s satirical comedy (originally produced in 1960) has made me wish even more that I had been able to see some of their previous plays. It’s a visually striking and well-presented representation of Soyinka’s satire of life in his home country, well-realized by strong direction and a good cast. Telling the story of an itinerant self-proclaimed prophet, The Trials of Brother Jero depicts a day in the life of Jero (Ron Himes) and showing his influence on life in his small fishing village and his manipulation of people and situations around him. Jero is an opportunist who freely (and proudly) admits manipulating his followers for personal gain. On this particularly eventful day, Jero narrates his trials and tribulations after his disgruntled former mentor (Phillip Dixon) pronounces a curse on Jero, proclaiming that Jero’s downfall will be brought about by women, or “daughters of Eve”. Jero then sets about trying to disprove this pronouncement while displaying his simultaneous attraction and disdain for women, as well as his dominance over his most devout follower, a frustrated government-employed messenger named Chume (A. C. Smith), whose strong-willed merchant wife Amope (Velma Austin) camps outside Jero’s house to demand payment for a cape she sold him months before. Chume, however, has no idea that the man Amope is angry with is Jero. This situation and others provide for quite an eventful day for Jero, as his own attitudes and actions and those of his followers serve as the focus of a broadly humorous look at aspects of Nigerian society in the time the play was written. 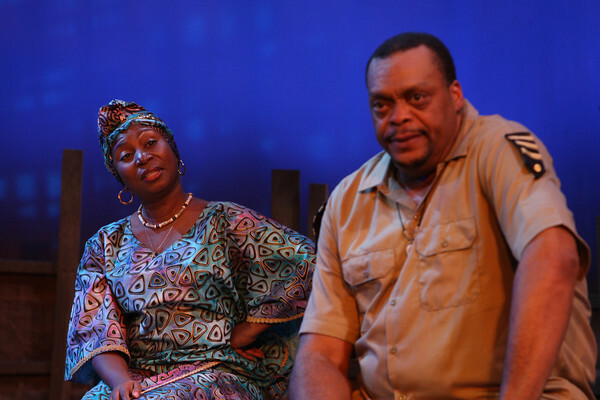 This relatively short play is well-realized by the production team at the Black Rep, and is particularly successful in its visual presentation and the performances of its leading performers, as well as its strong sense of musicality. The set and lighting, designed by Jim Burwinkel, and the colorful costumes by Marissa Perry effectively set the tone and atmosphere of the play. The lighting is particularly striking, and the relatively simple set provides the proper backdrop for the play’s action. I was particularly impressed by the musical sequences in the introduction and the conclusion of the play, as well as in a particularly memorable scene depicting one of Jero’s prayer meetings. A combination of strong ensemble singing, Linda Kennedy’s choreography and Arthur Moore’s expertly played drums adds greatly to the overall style and mood of the piece. As the scheming, self-centered Jero, Himes (who also directed the play) is an ideal centerpiece to the production. Even despite the character’s obvious flaws, Himes makes him unquestionably entertaining, displaying great comic timing and a sense of over-the-top grandiosity that is fun to watch, particularly in his scenes with Smith (in an equally strong performance as the clueless and misogynistic Chume) and Matthew C. Galbreath as a particularly gullible government official with whom Jero crosses paths. Austin, as the determined and outspoken Amope, also gives a strong performance, and her scenes with Smith are a comic highlight. The rest of the ensemble lends good support to the leading players for the most part, although there were a few performers in some of the smaller roles who could have shown more energy and presence. Overall, though, this is a mostly well-paced satirical farce that brings out the more ridiculous facets of its characters to outrageous comic effect. I had been unfamiliar with the plays of Soyinka prior to seeing this play, and I’m grateful to the Black Rep for bringing this acclaimed playwright’s works to the St. Louis audience. 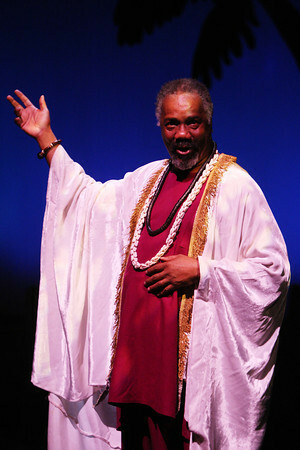 Although this play’s tone is broadly comic, Soyinka gives the audience a lot to think about in terms of what was going on in Nigerian culture at the time, and particularly the influence of religious charlatans, ineffectual government leaders and the roles of and attitudes toward women in that society. It’s a strongly written play with broadly drawn characters and situations, shedding light on specific details of a culture with which modern-day Americans may be unfamiliar. It’s an educational, thought-provoking and, ultimately, very entertaining production from The Black Rep.